An official application for Cumberland Sausage to be granted protected status has been handed to the European Union. Producers of the Cumbrian banger are hoping officials in Brussels will give it similar ranking alongside Champagne, Parma ham or Greek Feta cheese. This would prevent sausage-makers outside the region using the title “traditional Cumberland sausage”. 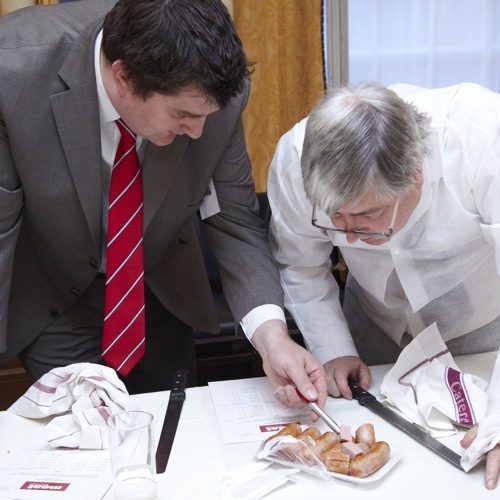 The campaign is being run by the Cumberland Sausage Association, which was set up in 2005. Association members believe the criteria for a Cumberland sausage is a high meat content of about 90%, the sausage to be coiled, not linked, a wider diameter than conventional sausages and a rough cut texture. Cumbrian farmer Peter Gott said : “We have got a passion for food in our area and traditional Cumberland sausage should only be made to the benchmarks. “This is in fact the only application for a sausage from a certain region, made a certain way, in the country.